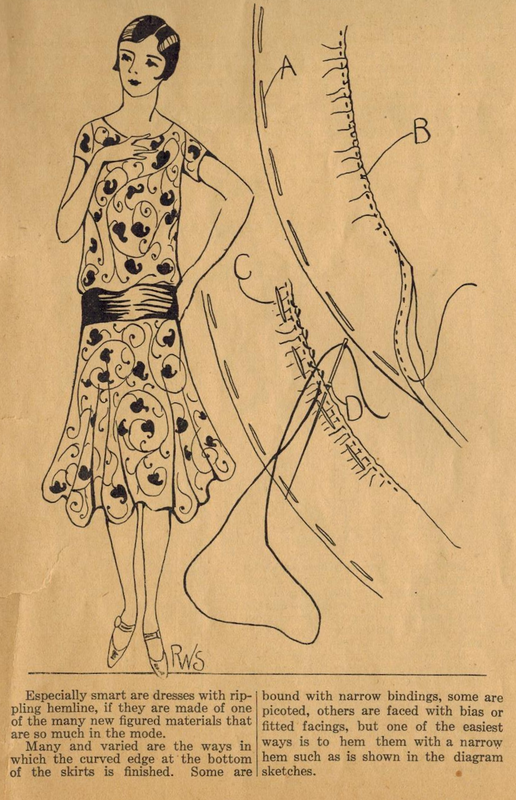 In this tip for home sewers in the 1920s, Ruth Wyeth Spears tackles the subject of "rippling hemlines". She refers to the "new figured materials", by which I do believe she means what we would call a print fabric (rather than a solid color fabric). Along with suggestions of various methods, Ruth illustrates how to best hem these curved edges. Ruth always provides such fine illustrations to accompany the explanation. That's fascinating to learn about. Hand sewn stitches, I learned from Stanley Hostek, are much stronger than machine sewn for garments meant to last. That is so wonderful to learn, ~GG~, I appreciate your sharing it. I really like the technique that Ruth describes here. And to know that that these are stronger than a machine sewn hemline is a rather rewarding thought!